The team of researchers at Saarland University, led by Professor of Condensed Matter Physics Karin Jacobs, initially had something quite different in mind. Originally, the team set out to research and describe the characteristics of hydrophobins – a group of naturally occurring proteins. 'We noticed that the hydrophobins form colonies when they are placed in water. They immediately arrange themselves into tightly packed structures at the interface between water and glass or between water and air,' explains Karin Jacobs. 'There must therefore be an attractive force acting between the individual hydrophobin molecules, otherwise they would not organize themselves into colonies.' But Professor Jacobs, research scientist Dr Hendrik Hähl and their team did not know how strong this force was. This is where the neighbouring research group led by Professor Ralf Seemann got involved. One of Seemann's research teams, which is headed by Dr Jean-Baptiste Fleury, studies processes that occur at the interfaces between two liquids. The research team set up a minute experimental arrangement with four tiny intersecting flow channels, like a crossroads, and allowed a stream of oil to flow continuously from one side of the crossing to the other. From the other two side channels they injected 'fingers' of water which protruded into the crossing zone. As the hydrophobins tended to gather at the interface of the carrier medium, they were in this case arranged at the water-oil interface at the front of the fingers. The physicists then 'pushed' the two fingers closer and closer together in order to see when the attractive force took effect. 'At some point the two aqueous fingers suddenly coalesced to form a single stable interface consisting of two layers,' says Ralph Seemann. 'The weird thing is that it also functions the other way around, that is, when we use oil fingers to interrupt a continuous flow of water,' he explains. This finding is quite new, as up until now other molecules have only exhibited this sort of behaviour in the one or the other scenario. Normally proteins will orient themselves so that either their hydrophilic ('water loving') sides are in contact with the aqueous medium, or their hydrophobic ('water fearing') side is in contact with an oily medium. That a type of molecule can form stable bilayers in both environments is something wholly new. Encouraged by these findings, the researchers decided to undertake a third phase of experiments to find out whether the stable bilayer could be reconfigured to form a small membrane-bound transport sac – a vesicle. They attempted to inflate the stable membrane bilayer in a manner similar to creating a soap bubble, but using water rather than air. The experiment worked. The cell-like sphere with the outer bilayer of natural proteins was stable. 'That's something no one else has achieved,' says Jean-Baptiste Fleury, who carried out the successful experiments. Up until now it had only been possible to create monolayer membranes or vesicles from specially synthesized macromolecules. 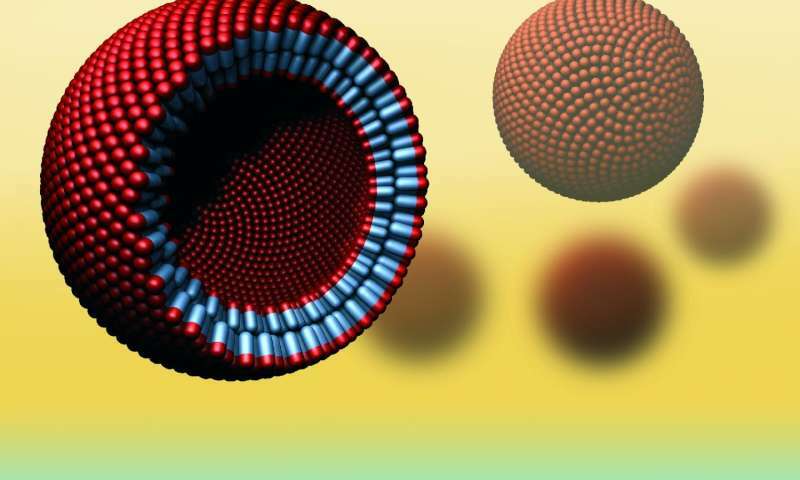 Vesicles made from a bilayer of naturally occurring proteins that can also be tailored for use in an aqueous or an oil-based environment are something quite new. In subsequent work, the research scientists have also demonstrated that ion channels can be incorporated into these vesicles, allowing charged particles (ions) to be transported through the bilayer of hydrophobins in a manner identical to the way ions pass through the lipid bilayers of natural cells. The results of this research work were a surprise. Originally, the goal was simply to measure the energy associated with the agglomeration of the hydrophobin molecules when they form colonies. But the discovery that hydrophobin bilayers could be formed in both orientations, opened the door to experiments designed to see whether vesicles could be formed. That one thing would lead to another in this way, offers an excellent example of the benefits of this type of basic, curiosity-driven research. 'The "discovery" of these vesicles is archetypal of this kind of fundamental research. Or to put it another way, if someone had said to us at the beginning: "Create these structures from a natural bilayer," we very probably wouldn't have succeeded,' says Professor Karin Jacobs in summary.